If you’ve been earning and saving American Airline miles and are ready to begin redeeming them, you have a few options when it comes to getting the most out of your miles. AAdvantage has three awards charts that are available to base your award on. Between the three charts there are 20 airline partners that you can book on for domestic and international flights. The charts include the American Airlines Award Chart, the oneworld and Other Airline Award Chart and oneworld Explorer Chart. To book a basic round trip itinerary or one way, likely the best option would be to book referring to the American Airline Awards chart, especially if it’s a domestic flight and you are not picky on the airline you fly with. When booking travel using the AA Award chart all travel must be on flights operated by American Airlines or its affiliates–American Eagle or American Connection. You can book flights with American Eagle and American Connection on the AA website, but you won’t be able to book other partners on the website (Alaska Airlines being the only oneworld exception). You can also book international flights based on the award chart, but you are limited to flights operated by AA or it’s affiliates. You cannot book an award with one of the 25 partners based on this chart. One major convenience factor of basing an award on this chart is that you can book online. The major drawback is that you cannot book flights on any of the oneworld partners. The miles required to book an award start at 12,500 miles for a one way domestic economy. For international awards, depending on the time of year and the region you are visiting, the miles required for travel will vary. American Airlines prices out the award based on the season and demand of travel. It will be cheaper to fly in the off-peak times vs. peak travel season. If your travel dates are flexible you can save thousands of miles by booking awards that have travel during off-peak periods. What are the different award options? There are three main tiers on the AA award chart that depend on the time of travel and award seat availability. By planning out an award far enough in advance you get the best and cheapest award options. The three types of award options are MileSAAver Off Peak, MileSAAver and AAnytime. MileSAAver Off-Peak (fewest miles): Off Peak MileSAAver is only available on coach flights and the availability is limited. If you are able to snag an Off-Peak MileSAAVer award and already intend to fly coach, you will be getting a decent deal, more than half the cost of an AAnytime award ticket. MileSAAver (midlevel miles): MileSAAver awards are the discounted awards seats available on Economy, Business and First class and cost the same as the AAnytime Award. Unlike the AAnytime awards, there is a change fee for any flight adjustments and there are fees for checked in luggage. AAnytime (most miles): The AAnytime Awards tickets stay consistent with being available at anytime, unlike some of the other categories that are offered seasonally. Perks of the ticket include Priority AAccess boarding pass and no fees for making changes to your flight. Essentially it’s treated as a Y class ticket. For domestic awards, regardless of where you would like to travel within the US, the cost of the award will stay the same and the amount of miles flown does not matter. For example, if I wanted to fly from Los Angeles to Washington DC, the base rate would be 12.5k each one way. If I wanted to fly from Los Angeles to Portland, that too would be 12.5k per one way–even though it’s much closer. The nice thing with American Airline miles is that you have several award chart options to choose from that can help you maximize the miles. When booking international awards you have the choice to book on any of the partner airlines in the oneworld alliance. Redeeming AA miles based on the oneworld and Other Airline Award chart is the best option for international award travel. American Airlines is a oneworld partner, but also has several partners that are not associated with oneworld that you can use AA miles on. The options for booking awards to destinations that AA does not operate to is still possible using AA miles, you just have to book a flight on a partner airline. To book an award on any of the oneworld or other partners, you must call and make reservations with an AA agent over the phone. Booking over the phone comes with a $25 charge and is mostly unavoidable, however it’s a small cost considering you get to book the flights you want. Using the oneworld and Other Airline Award chart you can book flights on 25 international and domestic partners. Between these partners you can virtually find service to any destination in the world. 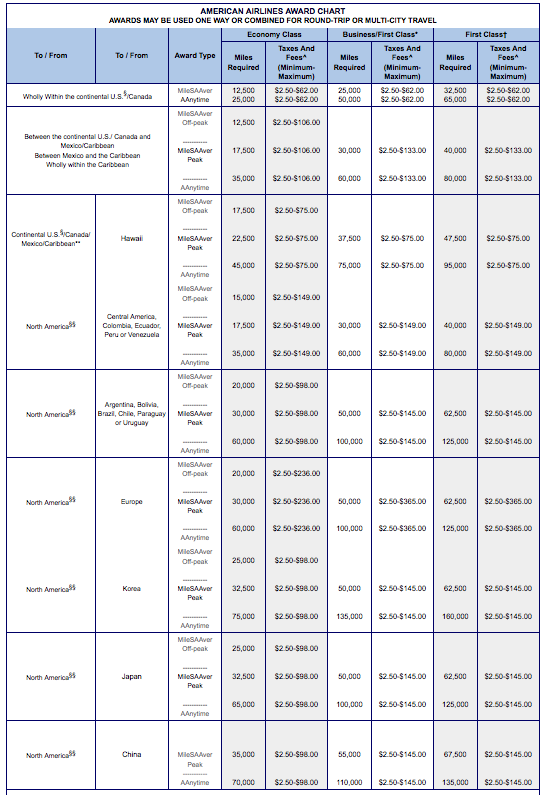 The award chart is based on zones and regardless of the city you are visiting within the zone, the price will be the same. Another benefit that this chart offers is Off-Peak rates for economy seats for certain zones which starts at 20k miles. These lower priced awards can save you anywhere from 10k miles for a one way to 20k miles per round trip. Off-Peak awards are available for Asia Zone 1, Central America and South America Zone 1, southern South America, Europe and Hawaii. Unfortunately they are not an option for Asia Zone 2, the Middle East or the South Pacific. South Pacific: Australia, Easter Island, Fiji, French Polynesia, New Caledonia, New Zealand, Papua New Guinea, Republic of Tonga, Republic of Vanuatu, American Samoa and Samoa. American Airlines does not charge a fuel surcharge, but if you are booking on partner airline using your AA miles they you may have to pay (depending on the airline). Airlines such as British Airways and Iberia tack on fuel surcharges that can be upwards of ~$400. As far as taxes and carrier fees, AA only charges around $10. Since I love stopovers I always try to include them. In my opinion they are one of the easiest ways you can really maximize your miles on one trip. AA allows stopovers, but their stopover rules are a bit tricky and not as flexible as what is allowed by United. You can have a stopover on either a round trip or one way award. The stopover must be in a North American Gateway City (US, Canada and Mexico). The trip must also include an international destination meaning that you cannot have a stopover on domestic round trips. No international stopovers. The only criteria for a valid stopover city is that it is the last city you connect through in North America, or the first city you connect through on return. In most cases the stopovers can be made in the major AA hubs, but you can route through more desirable North American cities that connect to your international destination. Some of the more interesting stopovers include: Mexico City, Cancun, Vancouver, Montreal and Toronto. Booking two one way awards essentially gives you two stopover options on a round trip itinerary. This is one of the biggest perks of booking awards with AA miles. You could have a stopover in New York since it is the last North American international gateway city–the last connection city before flying to Cape Town, South Africa. You could also have a stopover in Mexico City on your return since it is the first North American international gateway city you route through. This may seem like a drawback since you don’t have as many destinations in certain parts of the world, but for the most part oneworld covers most anywhere you can think of traveling. c) you complete all travel within one year of booking your award. When booking oneworld or partner flights using American Airline miles you will most likely need to do some research. First, decide which airlines you want to use (if you have a preference). For example, is there an airline that has a great first class cabin that you’ve been wanting to experience? Or is there an airline that has direct flights to a destination? Another thing to consider are the taxes and fees and fuel surcharges some airlines charge. I always try to avoid these at all costs because they make free travel…well, not free. The oneworld award chart categorizes the total miles traveled on one award–starting from the first flight to the last flight–into different distance zones. The distance zone your award falls into determines the amount of miles needed to redeem the award. To get the most value per mile you want to be at the upper end of the zone. Meaning, if you are booking a distance zone 6 award you want your total trip miles to be closer to 19,999 than 14,001. Since the distance zones are spread across 5,000 miles, you are just giving away whatever miles you don’t use within each distance zone. Basically, just shoot to get as close to the maximum trip miles per zone. To find out which oneworld airline flies to specific destinations, refer to the oneworld Where We Fly tool. Once you’ve decided which airlines you’d like to fly with, using the tool you can search for the segments you want to book. Once you find the segments you are happy with, write down the flight number, date and time of each segment and call AA reservations. You have to call an agent to book the flight for you over the phone. The number for the AA reservation line is (800) 433-7300. Also keep in mind that Explorer Awards are based on total trip miles you’re traveling, so make sure that you have enough miles to cover all segments. 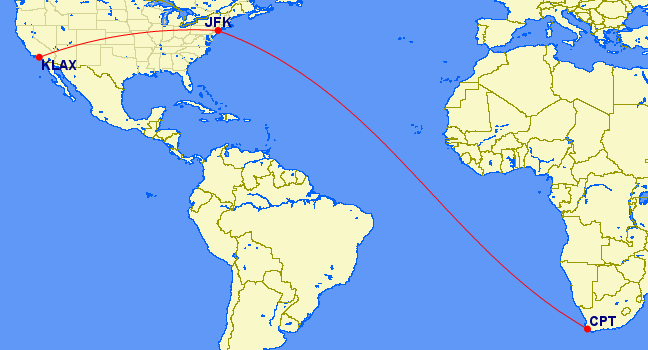 An easy way to check the total trip miles is by using the Great Circle Mapper. Enter your segments with airport codes and it will calculate the total miles traveled. The total distance of this trip is 29,300 miles which puts it in the Zone 9 distance category which requires 140,000 miles. Now that you know all about American Airlines Award charts, you can get ready to learn about award taxes and fees on the next post. Lisa – Since you’re correct about awards seats opening up on different segments at different times, you just have to check back to see if anything was released. Are you looking to fly on a certain airline? Since you’re booking so far in advance you should be able to find something that works, but if you are completely stumped you can submit a request to Award Magic through my award booking tab and they can do the work for you! Sometime it just takes a long time to find the itinerary you want because you have to hope that award seat availability will open up.